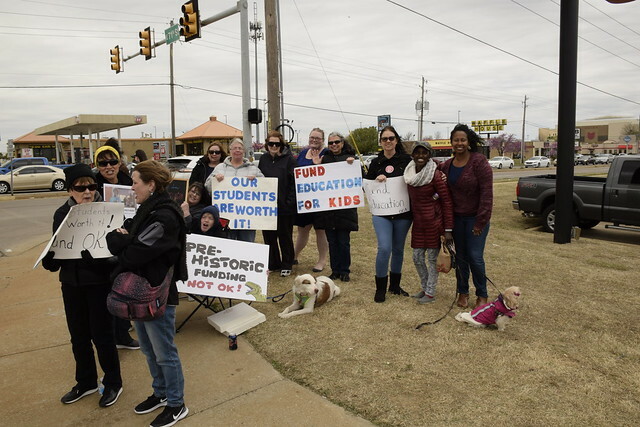 Our public teachers in Oklahoma have walked out of their classrooms and have been marching on our Capitol in Oklahoma City demanding that our legislature restore funding for education both teacher salaries and general funding for schools and supplies. Our Governor, Mary Fallin and the Republican Party are running scared. Fallin claims that ANTIFA is behind the protest and has stayed away from the teachers to hang out with oil billionaires at Oklahoma City Thunder Games. The legislative leadership insists that many of the protesters are paid from out of state. We have a situation where our representatives are scared of the citizens they are supposed to represent. I ran across these folks here in Tulsa. They are teachers, parents, and children. They are getting paid with horn honks by supportive passing motorists. I think the people of Oklahoma have had enough. The last ten years or so, the state has entered this grand experiment led by a combination of Christian Dominists and Tea Partiers who have done all they can to defund schools and lower taxes with the promise of everlasting prosperity. The experiment has failed, just as it has in Kansas, Louisiana, and other places. They have frittered their time away by eliminating restrictions on guns, installing Ten Commandments statues on public property that had to be removed later, passing unconstitutional abortion laws and in general just wasting time, money and energy. Now they are being called to account for all that and that is making them scared and angry. We are seeing the ugly face of entitlement from many of our representatives. Oklahoma had a long history of populism way back when and I always wondered what happened to it. Maybe it is coming back? 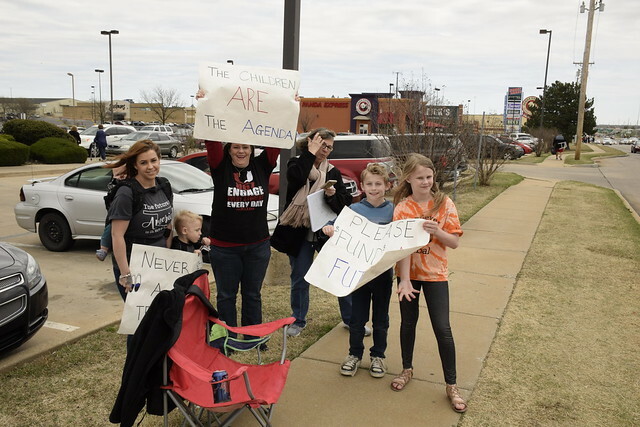 This entry was posted in Politics and tagged Oklahoma Government, Protests, Teachers on April 6, 2018 by Alan Bates.